It's been a crazy year! Here's a brief look into this year's reading! The first half will feature my Goodreads year in books, followed by the first part of The Perpetual Page-Turner's End of Year survey. 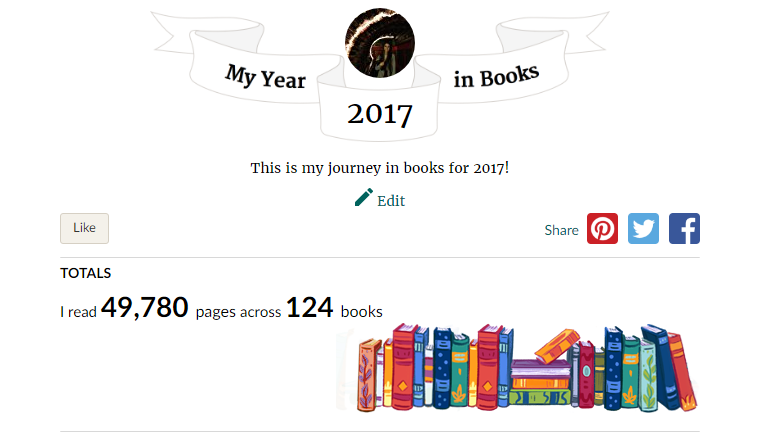 My full Year in Books pages is here: https://www.goodreads.com/user/year_in_books/2017/11188049? For a second year in a row I have read more than I ever had before (well, since I started using Goodreads, anyway. I'm sure I read a lot when I was a kid!) I'm incredibly surprised by this number and I still have no idea how I managed to read that many, what with finishing up university, taking care of my mom during surgeries and chemo, and moving. I think it's just because books are what truly help me deal with everything going on around me, whether I want to have characters to relate to or a world to just completely disappear into. This is also the year that I became a Book Depository affiliate and an Amazon affiliate! Any purchases you make through my affiliate links (found in various links on posts and always through my banners on the right side of my page) provide me with a small commission that is so helpful in managing my everyday necessities and making this blog better--I plan to expand in 2018! It's no surprise that Oathbringer took the cake for the longest book, and it was absolutely worth it because every page was amazing! 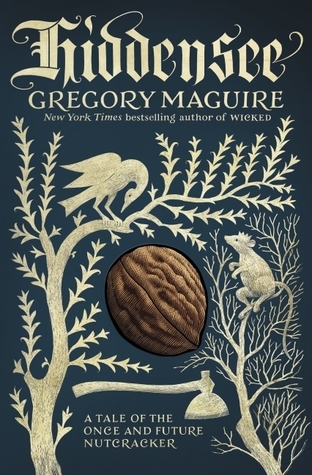 The Sleeper and the Spindle is such a lovely little Sleeping Beauty re-imagined tale and I can't recommend it enough. Cinder is definitely popular! I hope more people get around to reading Anne Bonnie sometimes also, it's just a fun little graphic novel, especially for younger readers who are looking for an awesome female protagonist who goes on adventures! I'm pretty surprised by my average rating. I think I'm usually pretty good at picking books that I think I would like, but part of this is also because I read a lot of 3-3.5 star books and on Goodreads I round them up to four. And of course Oathbringer would have the highest rating so far (it's up to 4.71 now! 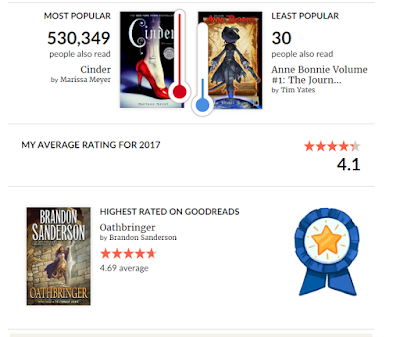 ), considering Words of Radiance has 4.77 rating with 118,000+ ratings! I encourage you to fill out this survey, also! It can be found at The Perpetual Page-Turner's blog. I've decided to split this into two posts because of how extensive it is. The second part will be up on Friday! 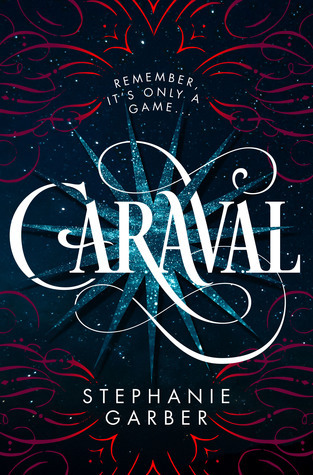 Genre You Read The Most From: I haven't counted, but I can easily tell you that the answer is undoubtedly fantasy. The World of Tomorrow by Dave Matthews (review) - This was a pleasant surprise mainly because I really didn't know what to expect at all and it ended up being fantastic! The Changeling by Victor Lavalle - I had vague notions of what this book would be about ("dark New York fairy tale"), all of which it lived up to, but.... it got a little crazy. 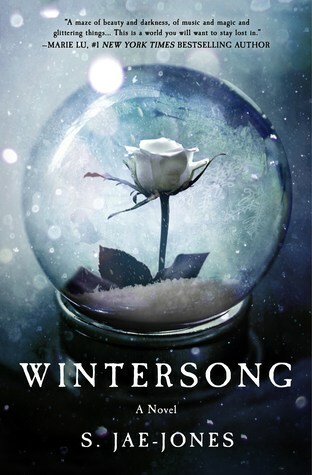 And I'm not sure if it was a good or bad surprised, but the second of this book definitely surprised me. 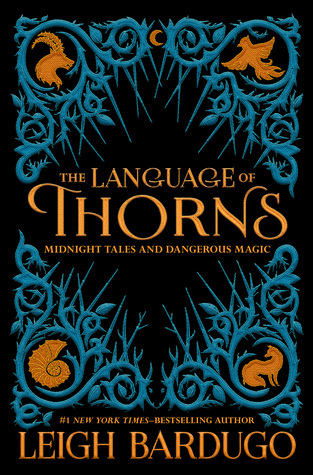 Well, I’m not really sure how many people actually picked up some books I highly recommended to them, but my mom did pick up (and love) the A Court of Thorns and Roses trilogy this year after I raved about them so much and encouraged her to read them. I also got my boyfriend to start Sabaa Tahir’s An Ember in the Ashes (and the sequel! ), which made my pretty happy. He even enjoyed them (he tends to read mainly nonfiction when he does read)! 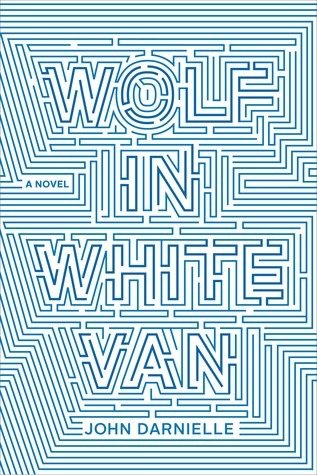 Josh Malerman, Kevin Hearne, technically Robert Jordan. I hadn't read any of these authors before, so even though I knew of them before this I still hadn't read anything by them. I read my fair share of nonfiction throughout the year, but it usually is not even close to medical related (not interested, usually), but these two were great! Honestly, too many to list! I would like to re-read a lot of what I read this year. 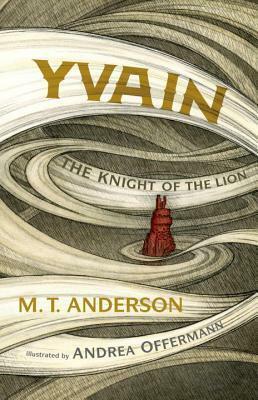 In particular, I'd like to re-read a lot of the fantasy debuts I read this year, as well as many of the series I've already read. 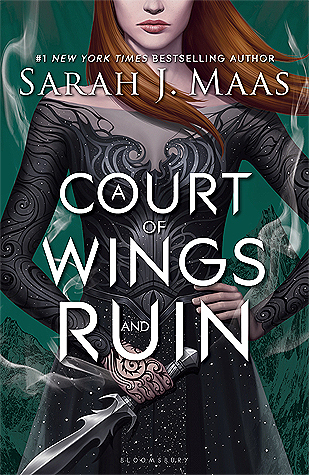 A Court of Wings and Ruin- all of them? Amren, Mor, Cassian, Azriel, Feyre, Rhysand.... I just love this group. 13. Most Thought-Provoking Book of 2017? The Hate U Give by Angie Thomas (review) - an incredibly important book about the black lives matter movement and racial issues that are still very present. Bird Box by Josh Malerman - this really just made me think about fears and what can escalate them. The necessary blindness in this book, along with the unknown element and the question of insanity and madness have provided for many thoughtful moments. I have a lot, but I’m narrowing it down to… less than a lot, but still more than only a few. I’m sorry. Books are beautiful. “The heavens grant us only one life, but through books, we live a thousand." “Conquer your fear, and you can conquer the world.” – This one has helped me endlessly this year. I have repeated this phrase in my head so many times this year, it’s actually crazy. Thank, Mr. Kristoff. “Arneisians had a dozen ways to say hello, but not word for good-bye. When it came to parting ways, they sometimes said vas ir, which meant in peace, but more often tey chose to say anoshe--until another day. Anoshe was a word for strangers in the street, and lovers between meetings, for parents and children, friends and family. It softened the blow of leaving. Eased the strain of parting. A careful nod to the certainty of today, the mystery of tomorrow. When a friend left, with little chance of seeing home, they said anoshe. When a loved one was dying, they said anoshe. When corpses were burned, bodies given back to the earth and souls to the stream, those left grieving said anoshe. Anoshe brought solace. And hope. And the strength to let go.” – I am indeed considering an Anoshe tattoo one of these days. I’ve dealt with a lot of loss in my life and I think that this is just such a beautiful word and idea, it really resonates with me. "‘Have you ever considered, bridgeman, that bad art does more for the world than good art?Artists spend more of their lives making bad practice pieces than they do masterworks, particularly at the start. And even when an artist becomes a master, some pieces don’t work out. Still others are somehow just wrong until the last stroke. ‘You can learn more from bad art than you do from good art, as your mistakes are more important than your successes. Plus, good art usually evokes the same emotions in people--most good art is the same kind of good. But bad pieces can each be bad in their own unique way. So I’m glad we have bad art, and I’m sure the Almighty agree.’"
“Art is about emotion, examination, and going places people have never gone before to discover and investigate new things. The only way to create something that nobody hates is to ensure that it can’t be loved either. Remove enough spice from soup, and you’ll just end up with water." 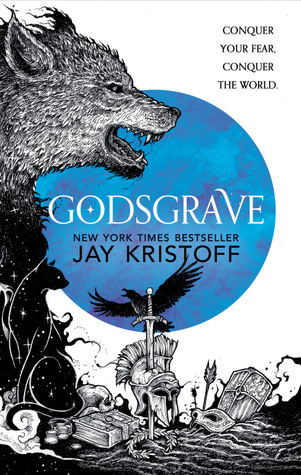 Godsgrave by Jay Kristoff -- I don't have any idea who else could possibly win this award other than Mr. Kristoff himself. The only that comes to mind at this moment would be Feyre and her partner (I realized saying who it is could be a spoiler? But those who have the book will know!) I'm also quite a fan of Rhys and Alucard from the Shades of Magic series. This is a difficult one. There are a lot of friend/etc. relationships that I loved in a lot of books I read this year, but I think the friendship between Adelaide, Eleanor, and Beatrice in The Witches of New York by Ami McKay (review) was truly quite lovely. I love strong female friendships. This was surprisingly more difficult than I expected. I would say A Conjuring of Light by V.E. Schwab. Strange the Dreamer by Laini Taylor was also a pleasant addition to Taylor's other work. Cinder by Marissa Meyer! I never planned to read this series because cyborgs just didn’t sound interesting to me, but wow was I wrong and everyone else was right! Now this is just cruel because there were somany. Can I just make a brief list of some of the best ones? Oathbringer, hands down, because Sanderson is the king. 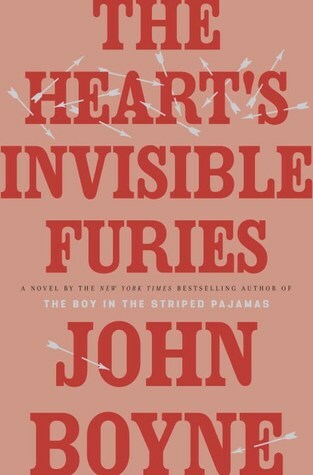 The Heart's Invisible Furies by John Boyne. Well that's all for this post! Feel free to head over to The Perpetual Page-Turner and fill out this survey yourself, and let me know your thoughts! What a thorough survey. This will be a fun survey to compare, year by year, I think.